On Monday, Colby “Chaos” Covington made an appearance on The MMA Hour to speak about what he wants next. The controversial welterweight star made it clear that he has his sights firmly set on former training partner and current UFC Welterweight champion, Tyron Woodley. In June this year, Covington was victorious in a contest for the interim Welterweight title against UFC veteran Rafael Dos Anjos, making him the undisputed number one contender for a shot at Woodley. The fight has been put off for quite some time now, due to injuries to both men and the arrival of Kamaru Usman as a true contender for the belt, there is some doubt as to if or when the bout will go ahead. Who deserves the next title shot at 170lbs? Covington had to turn down a bout against Woodley earlier in the year due to sinus surgery and a torn ligament in his foot. Now, Covington says he is “100 percent healthy”. The 30-year-old Covington stated that he would prefer a full training camp, given the fact that UFC 233 goes down in less than seven weeks, but he made it clear that he is more than happy to fight Woodley in Anaheim if the UFC want that fight to go ahead. Colby Covington has angered many UFC fans with his comments with Brazil his public support of President Donald Trump. Despite Covington’s own issues which rendered him unable to compete, he puts the blame on the champ for their bout not going ahead. He spoke in a similar fashion to UFC President Dana White, slating Tyron Woodley for being, in their opinions, inactive. “What’s going on at welterweight is the same thing that’s been going on for the last year or two,” Covington said. “I’ve been waiting for the UFC to send me a contract with Tyron Woodley’s name on it and he’s not signing the contract. He’s been kind of ducking and waiting. He’s trying to pick his spots. He’s trying to go to TMZ and still have that title as champion, so he’s just trying to get these cameos over in Hollywood. He doesn’t want to fight, he’s not here to make the welterweight division great again like myself. That’s what’s going on, I’m waiting for him. We’re fighting next, I don’t care what it is. “I don’t side with anybody, but I do know that Tyron Woodley doesn’t fight enough because after I fought, he hadn’t fought in a year, 13 months, that’s why they made the real belt, America’s belt. Then all of a sudden he wants to fight 14 months later, which is two months after my fight and he knew I had to get surgery so he was trying to get me when I wasn’t healthy. 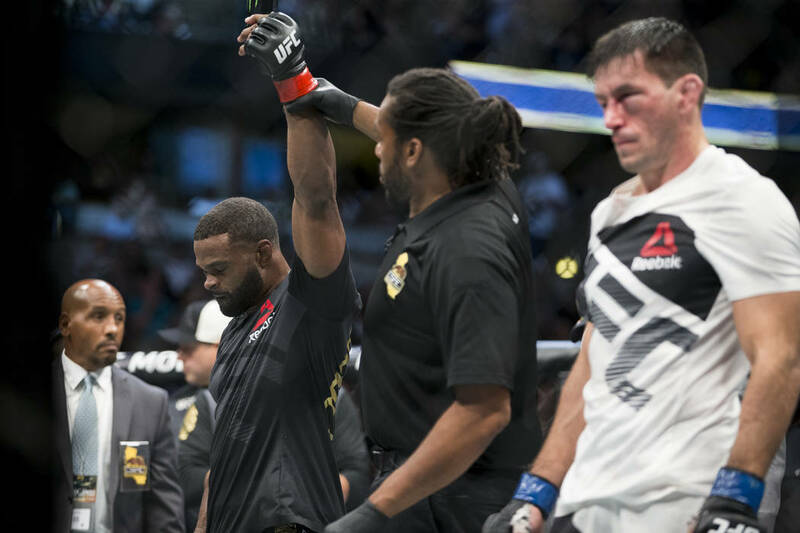 Woodley defeated Maia by Unanimous Decision at UFC 214. Following Kamaru Usman’s dominant victory over Rafael Dos Anjos, he called out Colby Covington, feeling that the pair should have a title eliminator bout. However, Covington was quick to dismiss any talk of taking anything other than a title shot.